The brown tree snake (Boiga irregularis) is a narrow and venomous reptile that is part of the family Colubridae. Brown tree snakes give their victims doses of poison by munching into them. The nocturnal creatures are usually brownish-green or yellowish in coloring, and are memorable for their eyes, which jut out prominently. Brown trees snakes are highly versatile in their choices of living environments. Brown tree snakes usually grow to between 3 and 6 feet in length, according to the Fort Collins Science Center. They are not choosy diners, and readily feed on many types of foods, including nestlings, birds, tiny mammals, lizards, amphibians and even fellow snakes. Brown tree snakes are sometimes even seen looking through human trash for their next meals. These reptiles are highly proficient at climbing. Brown tree snakes come from Papua New Guinea, Indonesia, the Solomon Islands and both the northern and eastern regions of Australia. As a mishap, brown tree snakes were also brought into Guam, which is a United States remote island territory. They got onto the island through cargo ships. In Guam, they are considered to be invasive pests for a variety of reasons. Not only do the clandestine and arboreal snakes linger on power lines and trigger electricity issues, they also sometimes prey on domestic pets. They also are serious predators for native birds on Guam -- and have done away with numerous species. Brown tree snakes can be found in many settings, including rugged outcrops, woodlands, savannas, arid and damp forests, shrublands, rain forest, mangroves and heathlands. They occur in elevations up to 3,900 feet. Brown tree snakes frequently spend time in residential neighborhoods, as well. When female brown tree snakes lay their eggs, they generally do so inside of cavities of trees or in openings of rocks. 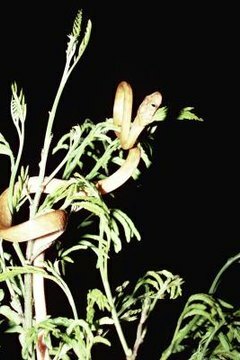 Although brown tree snakes are often tucked away up in trees, they do descend to the world below them for feeding purposes -- generally when it's dark outside. These snakes also spend a lot of time in caves and in empty tree logs. They employ a combination of vision and smell to locate sustenance. Brown tree snakes are notorious for entering into man-made structures on their quests for resting areas and food -- another reason why they are often viewed as pests. They often seek out sanctuaries away from hot weather conditions and glaring light.